Title: The Psalms – New International Version. ❖ Saint Joseph Catholic Edition. With Helpful Appendix. 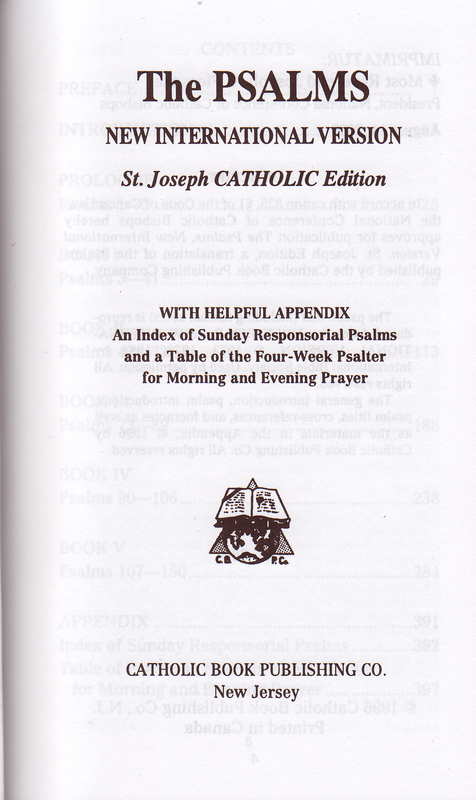 An Index of Sunday Responsorial Psalms / and a Table of the Four- Week Psalter / for Morning and Evening Prayer. Publisher: Totowa, N.J. (U.S.A.): Catholic Book Publishing Co. Contents: Psalms 1 - 150 translated after the Masoretic text. Pss- headings and verse- markings given, also cross- references and annotations. Comments: Flexible cover, 16mo, 400 pp. This unique book bears a distinct similarity to it's Catholic predecessor, the Revised New American Bible Psalm Book of 1992 and, even more in every respect, to the succeeding New Catholic Version Psalm Book of 2002. In the rescript the approval for publication by the National Conference of Catholic Bishops is declared! The preface lets the reader know that different translations (…) bring out nuances of meaning peculiar to each one and that »therefore, we have thought it worthwhile to make available a Catholic Edition of one of the very highly regarded and indeed most popular Bible texts in the world: The NIV«. Consequently extracts of it's preface that deal with the Psalter are printed. The reasons for the NIV Psalms to "Go Catholic" for some years or, vice versa, Catholics to "Go NIV", are quite obscure. To shed light into this peculiarity is not an easy task because the publishers are remarkably silent to every such kind of inquiry. 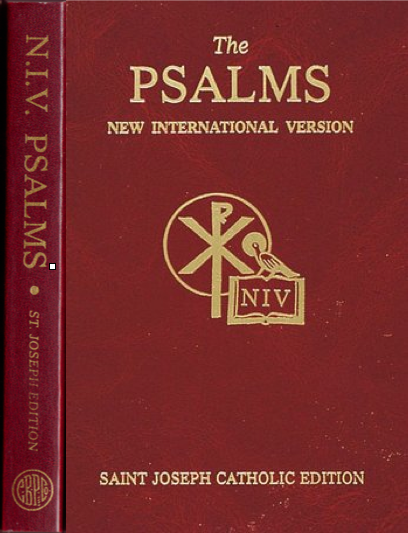 The NAB Revised Psalms, published in 1991, have been designed for the official and liturgical use. Is it that Roman Catholic believers at their prayers, who might disregard the NAB Psalter for private reading, should be provided with a version known to be quite successful in other factions of Christianity? Now there are not a few Catholic Psalter translations - think of the praised Grail Psalter - but this had been issued from 1983 on in an inclusive language and therefore lost their good graces and the "nihil obstat" of the church officials. 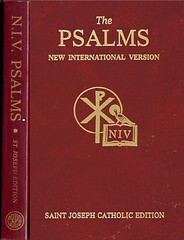 Besides that it is not part of the program of the Catholic Book Publishing Co.
On might doubt if this NIV Psalter was intended to become a long time runner and it might also be assumed CBP had already in mind to produce a follower called worthy of succeeding this stranger to the Roman Catholic realm. Howbeit - only two years later the NIV Catholic Psalter was dethroned - the NCV Psalter appointed instead. But only the Psalter of the NCV has been released since; the promised continuation is a long time coming….